Roger, CEO of Covenant, graduated from the University of Virginia before getting his law degree from the University of Richmond. 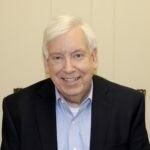 After practicing law in private practice, Roger joined Lawyers Title Insurance in 1992 to open the first non-attorney owned settlement agency in western Virginia. Roger ultimately grew the settlement operation to include three locations while taking on commercial real estate settlement services and facilitating IRS section 1031 tax-deferred exchanges. With a complete knowledge of the commercial and residential real estate settlement process, Roger brings professionalism and accuracy to every transaction for every client. Outside of Covenant, Roger enjoys spending time with his wife Kathy, a corporate attorney, and his two daughters, Kate and Kim, who are both currently blazing their paths in graduate school.